Press Release: May 20, 2018 By Sanman Promotions – Mike Plania got back on winning track via an emphatic first-round knockout win over Johnrey Lauza in the main event of the “Magic Show” fight card last Saturday night (May 19th) at the Polomolok Gym in South Cotabato, Philippines. 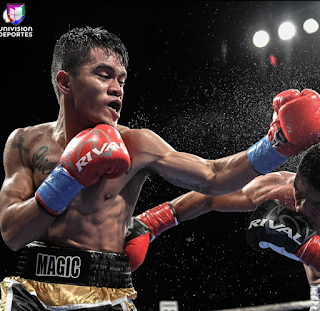 The swift victory allowed Plania to somehow ease the pain of his failed U.S. debut when he lost to Juan Carlos Payano via unanimous decision last March 23 at the Seminole Hard Rock Hotel and Casino in Hollywood, FL. “I’m happy to be back in the winning column. The loss to Payano only made me a better fighter,” said Plania, who improved to 15W-1L-0D, 8Kos. With the win over Lauza, Plania is now more upbeat in his desire to achieve his ultimate goal. “I will be a champion,” he said. Sanman Promotions CEO Jim Claude Manangquil said the victory was a huge confidence booster for Plania. “It was a good tune-up fight for Plania to get his confidence back. Up next for him will be a regional title or a fight in the US” Manangquil said. In other fights, Jake Bornea scored a UD win over Jun Eraham, while former world champion Randy Petalcorin knocked out Jade Yagahon in the very first round. Stephen Bontuyan nailed a UD win over Yoben Limentillo, Jerry Francisco earned third-round technical knockout win over Frankie Batuon, Wendell Plania posted a UD win over Junrex Saldivia, Carjun Carcosia recorded a first-round knockout win over Jason Tresmonte and Judy Flores defeated Jan Jan Santos via UD. For more information about Sanman Promotions and to watch the Sanman Live Boxing series visit Sanman Promotions’ official Facebook page: www.facebook.com/SanmanPromotions.